There’s still room on some of our March trips, but if you are checking airfares into Key West, you may get sticker shock! They were fairly low in January and early February, but now that Spring Break has kicked in, the fares have gone way up. Here’s a tip that may help: Fly into Ft. Lauderdale, rent a car and drive down the Keys, and save up to half on your airfare. For example, we just did a quick search on cheapfares.com and SouthWest Airlines, and round-trip flights from Washington Dulles to Key West in March are over $500. Dulles to Ft. Lauderdale round-trip flights are starting at about $230 (plus taxes and fees, of course). US 1 is a recent designee as a Great All American Road and a spectacular drive across historic railroad bridges and Caribbean-blue waters. Leave enough time, as the speed limit is 45 most of the way, and you’ll want to stop off at some famous—and quirky—places, like the Caribbean Club in Key Largo and Robbie’s Marina in Islamorada, home of the giant tarpon. Our Lower Keys kayak trips start around milemarker 25 in the Big Pine Key area. In a future blog post, we’ll list some of our favorites stops on a Road Trip to Paradise! 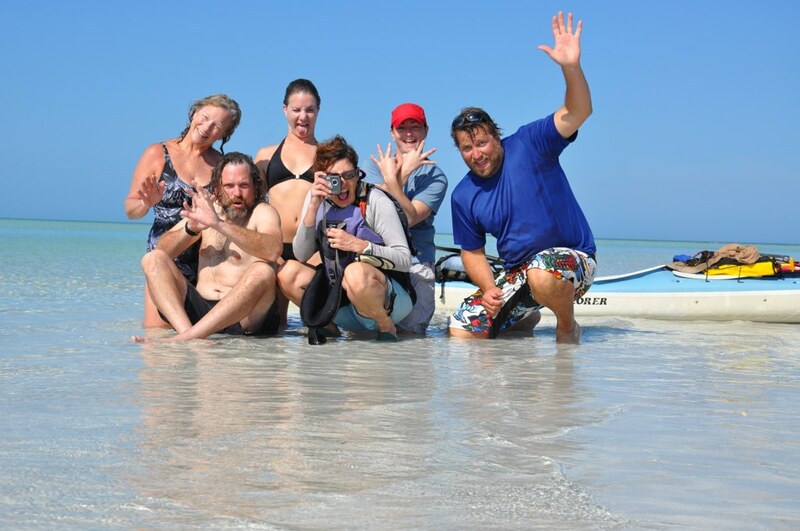 Check out our slide show of backcountry kayak camping in the Florida Keys. We do it in style! Also, here's a blog post from a customer on this trip. She did a great journal of words and photos: blow-by-blow of wildlife sightings, paddling routes and even menus! Warm and gentle winds from the south and east have caressed the Florida Keys these last few weeks and served as a good omen for the first BurnhamGuide trip of 2011 through the wide open waters of the Lower Keys Backcountry. When traveling by kayak, a tail wind is always appreciated; this one helped push our kayaks northwest for our nine-mile Day One journey. At Snipe Point, low tide exposed sand flats as far as the eye could see. It seemed entirely possible to walk to nearby Marvin Key across a watery desert. Far from barren, the flats at low tide reveal hidden wonders: marine worms, whelks, Florida fighting conchs. Then the tide rolls back in and the sun melts like a ball of yellow candy into a dark horizon. A billion stars emerged as we sat around the fire, soaking in the moonless sky. Come morning, a reddish egret chased minnows in a shallow pool in front of our tent. For three days we immersed ourselves, paddling along the edge of the Gulf of Mexico, making time to indulge our passions, be it yoga, journaling, photography, or just sitting on a beach where you felt like the only humans alive on the planet. Always close to our minds were encounters of the wild kind. At the Inner Passage, a three-foot sand shark approached, it’s camouflaged tan body blending perfectly with the bottom. It same me and with a "swoosh" it was gone. We bid it adieu and dug in our paddles for another gorgeous day of paddling in paradise. If you'd like to join us, BurnhamGuides still has room left on several trips in February and early March, 2011. Email or call 305-240-0650 for availability.